1) the historic extent to which markets fell, an unprecedented 23%, and that they did so all over the world. 2) its suddenness, how it appeared out of nowhere, and only took one day to play itself out. 3) its complete lack of explanation. To this day no definite reason for the decline has been isolated. Basic concepts such as cause and effect, predictability, and human rationality melt before the evidence of the record breaking decline. Why search for the cause of the crash? Have the 17 years that have passed made it irrelevant? Not at all. If we have insights into understanding the 1987 market crash, the most tumultuous movement ever in recent market history, then the basis exists for us get a better understanding of the market as a whole, and from there contribute a few insights into the inner workings of human nature. This is valuable knowledge. Not only is knowledge for knowledge's sake worth pursuing, but also the practical benefits of such knowledge. In the future, society may find it advantageous to limit extreme price movements like the 1987 crash because of the disruption they create. We can only do so if we endeavour to understand what actually caused the 1987 decline. By understanding the cause, we can determine whether crashes like 1987 are necessary to the functioning of our capitalistic system, or are mistakes created by human thought processes. There are several standard explanations that were immediately brought forth to explain the crash and have circulated ever since. I explain the successes and failings of each. 1. Why the crash occurred on Monday, October 19, 1987, and not any other day. 2. Why it occurred at the speed it did, playing itself out over 1 day, rather than slowly over the space of several months. 3. Why it fell to such an extreme degree, 23%, rather than a more rational 3-4%. 4. Why it occurred on an international scale, and not just in the United States. 5. Why no major news or significant events preceded the decline. I have been working on an explanation for the 1987 stock market crash for the past year. The theories proposed over the sixteen years since the crash have frustrated me because they have been unable to give convincing reasons for why markets could fall to such an extraordinary degree without any significant prior announcement or change in the world. Yet the decline cannot defy all logic, nor can it have emerged spontaneously. It had to have some cause, or a collection of causes. Intuitively, it seemed to me that the selloff was rooted in psychology, not in the structure of the markets or the events that occurred just prior to the crash. The problem with psychological explanations is that they reside deep in our minds and therefore are difficult to access. Typical explanations that resort to mob psychology and the irrational nature of crowds help us understand events like crashes in a very general way, but fall short when explaining the particulars of the one in 1987. In the paper below I tease out what I believe might have been the psychological cause of the 1987 crash. To put it briefly, in 1987, market participants felt that conditions were starting to resemble 1929, the year of the well known crash that ushered in the Great Depression. This feeling emerged from comparison of prices - if one overlays price graphs of the two markets, they appear eerily similar. Market participants started to compare the long seven year bull markets that characterized each era, and to many observers, the peaks and valleys near the end of their long bull moves seemed to overlap each other (see chart). My thesis is that a number of 1987 participants perceived a resemblance between their era and 1929, and sold stocks based on the analogy they had drawn. After all, why would anyone want to risk being caught by another '29 style crash and 30's Depression? The resemblance was only superficial, in reality 1929 and 1987 were two very different fish. Nevertheless, market prices were forced down by this selling, and in the eyes of market participants, appeared to be following 1929 even closer. Like a self-fulfilling prophecy, participant's belief that 1987 resembled 1929 resulted in trading that forced 1987 to conform to the old 1929 pattern. On Monday, October 19, 1987, enough people chose to sell based on the 1929-1987 analogy that the 1929 crash fully reappeared in 1987. 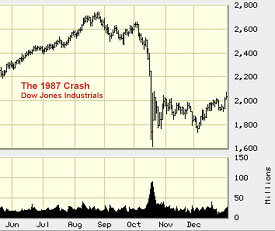 1) why the 1987 crash occurred on Monday, October 19.
in the historical model investors had adopted, the crash had occurred on a Monday in October, 1929. The overlap in Mondays resulted in a self-fulfilling prophecy to emerge in 1987. 2) why the move was so extreme in price. 1987 fell 23% because participants noted that 1929 had fallen 24%. 3) why it fell so quickly. 4) why 1987 was an international phenomenon. 5) how a lack of major news or important events prior to the decline could justify a 22% change. the cause was psychological, caused by an old memory. Thus it needed no events or important news to emerge. The theory also explains an observation that has been noted by many - why 1929 and 1987 are so remarkably similar in terms of shape, timing, and extent (see another chart). Another strange observation commented on in the press was the continued strength in the U.S. economy both before and after the market crash. If the decline was purely psychological, this explains how the stock market could decline even though the economy was still kicking on all cylinders. This is a simplified explanation, please read my essay Explaining the 1987 Market Crash (PDF) for a complete treatment. If all it takes to start a crash is a belief that current markets resemble past crash years like 1929 and 1987, then we may have crashes again in the future. Going into the second half of 2003, market participants are inevitably starting to make the perceptual connection between the present and 1987. Indeed, come October it has become a tradition to do so in the press. Commentators have warned about the potential for a repeat of 1987 every fall through the late 1980s and 90s, possibly causing small mini crashes in October 1989 and 1997 (see my paper for these explanations). It is entirely possible they will do so again. How might participants justify a perceptual connection between 1987 and 2003? Prior to the 1987 stock market crash, the bond market had experienced one its worst declines in history. The stampede from bonds this summer provides an analogy to the 1987 bond route. The argument has it that high interest rates will coax equity investors away from dividend bearing stocks to bonds, resulting in an equity selloff. The US dollar had been declining prior to the 1987 crash, and worries about record budget and trade deficits abounded. In 2003, the US dollar has again found itself in a strong downtrend, the budget deficit is ballooning as Bush wages war, and the trade deficit is hitting record highs. It is easy to see the similarities. In 1987, stock markets were overvalued by most fundamental methods of valuation. After rising for almost 10 months now, the present market finds itself again trading at an excessive price earnings ratio. As we approach October, these sort of analogies will appear in the press, on the internet, and be circulated in the trading community. Though they are superficial, if they capture the imagination of enough participants, a self-fulfilling process will emerge resulting in some sort of large decline. The purpose of this website is not to fear monger, but to spread understanding. Personally, I see no danger of a crash occurring. Overlaying the 1987 Dow on the 2003 Dow, there is little correspondence (see chart). In order for participants to truly believe that the two eras are similar the 'look' must be there. As of August 10 I can tell you it isn't, though if the Dow were to rise past its June peak and make a top sometime in late August, I'd be wary. Of course if we market participants simply stopped drawing analogies back to old crashes, or understood that attempts to do so might become self-fulfilling, then we would never create crashes in the first place. On the other hand, people who warn of crashes are not hurting society, they provide a useful function. By always keeping those who listen to them on their toes, they encourage a degree of selling pressure that help keep markets from getting too exuberant. You may find it interesting to read several examples I have found on the internet that demonstrate the emergence of 1987 analog style strategizing in 2003.